After a promising true freshman season (29 receptions, 429 yards 14.2 YPC and 2 TDs), A.J. 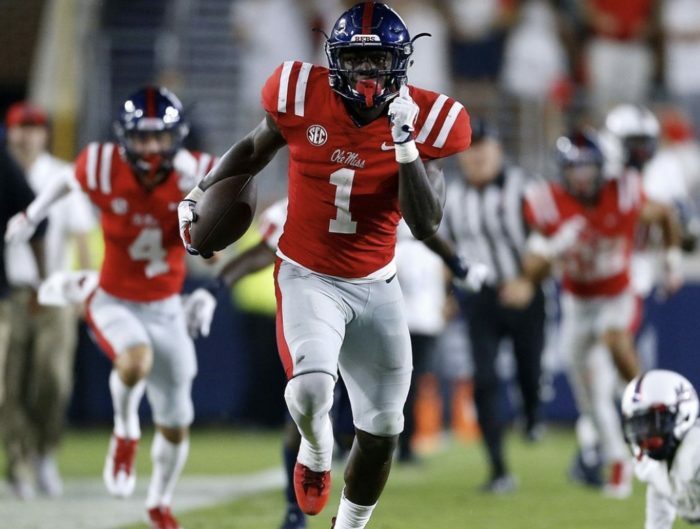 Brown had a breakout campaign in 2017 for the Ole Miss Rebels. His 75 receptions were 33 more than his next closest teammate. 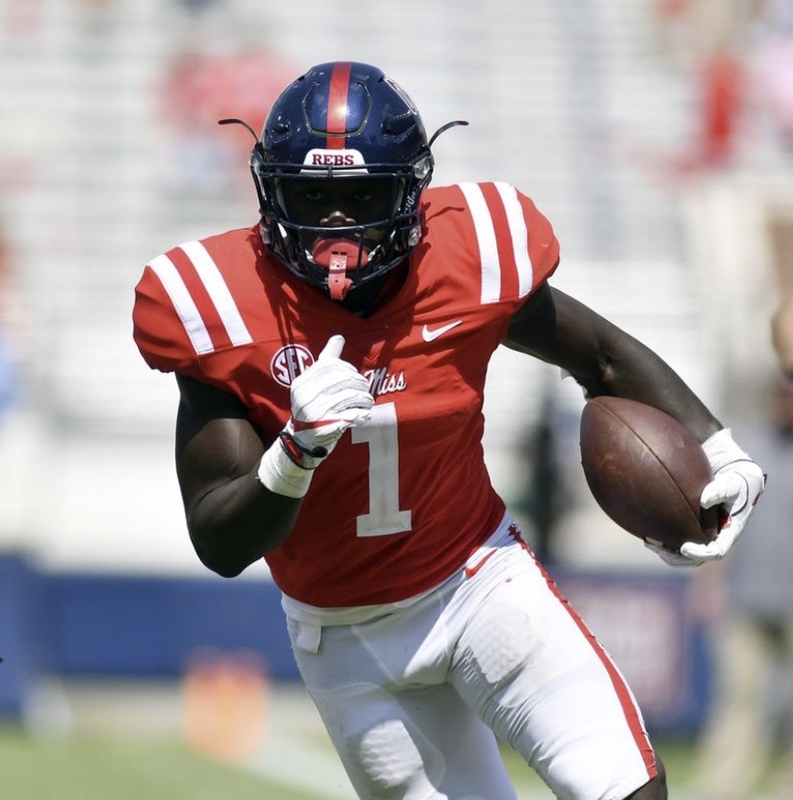 His 1,252 yards were nearly twice as much as any other Rebel. His 16.7 YPC was the second-best on the team and his 11 TDs were more than any other Ole Miss pass catcher. This was with two different QBs appearing in seven games each. Also in 2017 Brown led the SEC in receiving yards and receiving TDs. In addition, he finished second in the conference in receptions and sixth in total yards from scrimmage. The Starkville native burst onto the varsity scene as a sophomore by scoring six receiving TDs on just 15 total receptions. As a junior, he amassed 52 receptions for 1,019 yards and 16 TDs in 13 games. Then as a senior in 15 games Brown ripped 83 receptions for 1,371 yards (16.5 YPC) and 13 TDs. He averaged a healthy 91.4 receiving yards per game. 247sports.com ranked Brown as the 36th overall Prospect for the 2016 recruiting class, the 4th overall WR (behind Demetris Robertson, Tyler Vaughns & Tyrie Cleveland) and the #3 prospect in the state of Mississippi (behind Jeffery Simmons/Miss. St. & Benito Jones/Ole Miss). After much-vested interest and visits to Alabama and Mississippi State, as well as one to Cal, Brown ultimately chose to stay in state but not in Starkville. He signed a letter of intent on 2/3/2016 to play for Ole Miss in Oxford, Mississippi. Brown was not only a stand out athlete in football. He was a good enough baseball player to get selected in the 19th round of the 2016 MLB Draft by the San Diego Padres. 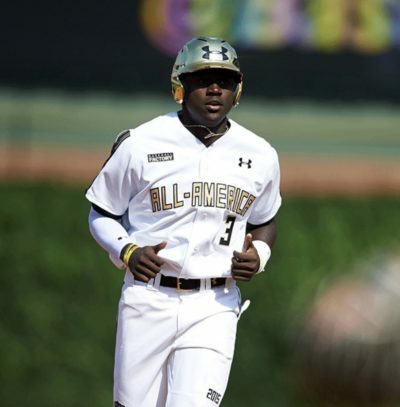 He was only the second athlete in history to play in the Under-Armor All-American Football Game and Under-Armor All-American Baseball Game. He also committed to play both baseball and football at Ole Miss. However, since he signed with the Padres he was not able to play college baseball. Since his collegiate football career has taken off it seems highly unlikely that he would return to baseball. You would swear he has biggest shoulder pads ever (most WRs wear smaller shoulder pads to allow for maximum arm range). He certainly does not look like a WR. He looks more like a TE and he definitely plays bigger than his frame. His size does not preclude him from being deceptive and ultra crafty. He is able to shake a DB off kilter with his swirling hips. He also displays the suddenness of a much smaller player during certain routes. His strength is long speed. So far he has been able to turn on the jets in space. His initial burst is serviceable but not sensational. It definitely takes him a step or two to get going. When he does get going defenders look like 5th graders trying to tackle a Kentucky Derby racehorse. He is a solid hands catcher but he can also adjust on the fly to make a body catch if the situation requires. He is very successful in shading defenders with his large frame, in turn, he allows himself to fully extend his arms. He is definitely one who rounds off at the top his stem. This not a huge issue but he will need to be more deceptive to win or create separation in the NFL. His big frame does help him win over and over again. He honestly will remind you of NBA Legend Karl Malone in the paint when he wins. Brown takes advantage of any free space or weakness and exploits it. I will concede that many other evaluators who I trust have praised him for his route running prowess. Brown has a legitimate skill set and enough size to be a WR1 in the NFL. He has also taken many snaps in the slot. That versatility could help him see a majority share early on in his NFL career. I don’t see a sure fire hall of famer, but he could certainly be a top 20 Fantasy WR for a hand full of years. The devy team here at DFF was ultra-impressed with Brown’s 2017 season. He made massive strides and was the Ole Miss target hound. They have him ranked as the 6th overall devy player (he was ranked 29th last year) and the 3rd best WR of the 2019 class behind only N’keal Harry (Arizona State) and Bryan Edwards (South Carolina). Brown enters his junior season with tons of hype. Devy darling D.K. Metcalf (r-soph) and senior DeMarkus Lodge also had career years in 2017. The competition within that WR room should bring out the best in all of them. The Ole Miss offense thrives on big passing plays. They gained nearly 4,000 yards (3,941 to be exact) through air and just 1,609 yards on the ground, the play split was 434 passing to 369 rushing. That’s 54% passing to 46% rushing. Brown’s 11 TDs were impressive and four of his first five TDs were from 58 to 77 yards long. He did not score versus Alabama (1 rec for 6 yards), Auburn (10 rec for 109 yards), LSU (4 rec for 39 yards) and Arkansas (2 rec for 48 yards). His first 6 TDs came versus South Alabama (8 rec for 233 yards & 2 TDs), Tennessee-Martin (8 rec for 156 yards & 2 TDs) and Vanderbilt (8 rec for 174 yards & 2 TDs). Do you see my concern here? Brown’s other big game came versus the Ragin’ Cajuns of Louisiana-Lafayette (14 rec for 185 yards & 2 TDs). His remaining three TDs came versus unranked Kentucky (7 rec for 65 yards & 1 TD), unranked Texas A&M (7 for 70 & 1 TD) and at #16 Mississippi State (6 rec for 167 yards & 1 TD). Of course, the Rebels would feed the beast (Brown) in his hometown versus their arch enemy. After hashing all that out, Brown is left with a mere 678 yards and five TDs versus eight SEC opponents (remember this includes 174 yards and 2 TDs vs Vandy). While in three out of conference games, Brown scored over half of his TDs (6) and produced 574 yards! That is 45% of his total receiving yards in those games against cupcakes. Brown should produce similar numbers in 2018, if healthy. Let’s hope for better numbers in the conference and just expect dominant performances versus Southern Illinois, Kent State, and Louisiana-Monroe. Flashing versus Alabama and LSU in September will go a long way in April and May.